Hear what Femi Fani Kayode said about Obasanjo’s open letter to President Jonathan. “OBJ has finally closed GEJ’s chapter with his letter. Jonathan is finished- mark my words. Abati should shut up and let his boss speak for himself on this one. The Ebora Owu has spoken and the issues that he has raised are too serious to be ignored or to be responded to with amatuerish and cheeky insults and slurs from a mere staff of the Presidency. The President should find the courage to personally answer the charges and address the message rather than get his aides to attack the messenger. As Baba said, Jonathan is “bleeding Nigeria to death”. It is time for change. Jonathan is not finished, he will even become stronger than expected. Shut a Fuckup! and don’t be sentimental. Don’t you have eyes to see what is going in your falling nation. Honestly, you are one of the reason this country is retrogressing. Femi Fani Kayode pls shut up!! No one needs your F-word opinions about what will happen or wont happen to Abati or jonathan. We can think for ourselves. we know your antecedents as a praise singer when Obasanjo misruled the country just like Jonathan is doing right now. So save your unwanted anotations for your gullible sphere of influence coz we Nigerians can separate the signal from the noise. So disrespectful of you to think we are forgetful!! As for Jonathan, I laugh in the face of whoever thought he had a clue and I am from the south south. GOD is d only one dat can decide who is going to lead us. Only God is in d right position to crown & enthrone… & no one else. Like OBJ had stated above anybody dat is attach to d process is only but an instrument… so leave GEJ to listen to d advice given to him by OBJ & work towards it, & let God do d final say! baba should leave the president alone, when he was in power he had every opportunity to turn this country around but he squandered all our resources, he his a juda please leave the president alone. come 2015 he shall rule again. Infact i really pity this uncle jona,as d man quickly rise,so he quickly fall,wel any how sha! He can neva turn to fisherman with dat our oil money he cant account for.but i known dat “Watsoever a man sow,surely he must harvest.his tenure as finished already. Who told you he will never return to his hole as a fisherman even worse because, the God of vengeance will reward him and his cohorts accordingly. No doubt about that. Femi Kayode, i never consider your comment because you are very Tribalistic .you never see any thing good from any other tribe, when Obasanjo was there what happens. Thank Obasanjo for his good job he have done for the Nigerian people. Mary Christmas and happy new year to all my fan in and out of Nigeria. Jonathan’s downfall is largelly contributed to by his wife’s unrestrained interfererance with very delicate national issues, she even had the efontry to insult the iconic Wole Soyinka and called him irresponsible in his comments when she made an attempt to persuade legislatures to approve elligaly money for her African first ladies projects. History will not forgive ‘Badluck Jonathan’ and his wife. Thank God things are shaping up gradually and come 2015 Jonathan and his wife will belong to the dusbin of history. GOD BLESS NIGERIA. Jonathan’s downfall was largely contributed to by his wife Patience for her unrestrained interfererance with very delicate national issues never seen before in the history of Nigerian politics. Patience never before done in Nigeria; requested FCT Minister to include her African First ladies project budget into the national estimates for legislatures approval, thanks to the eminent honourables who rejected it and tore it into the dustbin. She insulted the iconic Wole Soyinka who adviced her to keep within the limit of what the constitutions never prescribed for a first lady, she called Wole Soyinka irresponsible for reminding her the constitution of Nigeria has no mention of a first ladyship role not only Patience Jonathan but all Nigerian first ladies, including those of the states and local governments. Patience Jonathan wanted to surpass all records set by Nigerian first ladies, by her suggestion of an amendment to the constitution of Nigeria to include an office of a first lady as a political tool to reach out to women constituent legally and legitimately. This was a lady coming from obscurity and suddenly assumed a super first lady never seen in the history of Nigeria; who’ll lock down a whole business district of Abuja for her first lady projects and programmes. Air spaces are at a close when Patience is arriving at any airport in Nigeria and state capitals are completely codorned off for virtually the whole day for her security. A super first lady never seen before in Nigeria, not even Michel Obama has this kind of prevelidge. A first lady who transformed herself a queen at the presidency who all Governors must bow if they wish to solicit attention from Jonathan. A first lady who imorally draws salary from her husband home state for appointment she had never paid attention to. Nigerians can at this point pray to God change is coming when every Nigerian will feel a sence of belonging, not this devide and rule tenure of Goodluck Ebele Jonathan. GOD BLESS NIGERIA. Anybody dat is fighting Janathan, dat person is fighting against God. Act:5:38-39: And now I say 2 u keep away from GEJ and let him alone; 4 if this plan being a president or this work is of men, it wil come to nothing; v39: “But if it is of God, u cannot overthrow it-lest u even be found 2 fight against God.” mark of word! our president will never finish, in Jesus holy name…. what had ffk come up with again, was this not a man who was taken out of obscurity and given a post by obasanjo, simply because of what ffk’s father did and stood for in nigeria ….. he was given the position of aviation minister…. and then when out of office he was accused and stood before the tribunal for corruption, which up till recently has being postponed again…. I could remember the time he stood for elections in his state, and failed since then ffk has become a tyrant with his tongue wtihout respect, critcizing everyone that crosses his way even the opposite road ….. EG, bianca ojukwu recently…. in the past when for one reason or the other, he began to say terrible things about the man who fed him and made him whom he is today… OBASANJO… ffk began praising BABANGIDA…IBB, thinking he would win the presidential sit and then get a political high post, but unfortunately, the opposite was the case, he now made a u-turn to innocent citizens and made his personal life affairs global business…. FFK GO HIDE INSIDE THE CUPBOARD, DON’T COME OUT, TILL YOU ARE ASKED TO OR CALLED..
FFK, is this your interpretaton of the letter? Animal from the zoo like you. Let’s keep our fingers crossed. what this womanizer to yan sef. mr.pres.Ejhonatan pls!!! resign in peace or if u dnt much BLOOD will be sheded and after the crisis u goinna stil faild,the Blood dat u hav got from ur boys (BOKO HARAM) its okay,it can serve u for d rest of ur life in ur KINGDOM! presdnt.jhonatan dnt forget u’re using our blood for swiming pool and our flesh for ur meal in exchange of POWER! u made me to liv all my muslim freands tinkin they’re terrorist! god will surely punish u for ur did. Obasanjo is a fool, he did not put him there, even if he did and because he can not control him and loot the country’s wealth just like others, I feel sorry Nigerian leaders, they are all educated illiterates as all they see is wealth and they like it or not, they will all die one day and leave everything behind. Omo Faya you called an elder fool, think well before you give your self curse.Have you read the letter? It is left for Jonathan to take to advice andvmake amend.do you read what he said, he said non of his aides should join issues with baba, so if the man in question is not cursing why must you carry curse on matter that does not directly concerns you.GEJ knows what God use obj to do in his life…..if people like him did not talk to is you that is ignorantof the goings in the country that will talk?I don’t know your tribe but never you call your seniors fool not to talkmof someone that’s old enough to give birth to your mother. This foul-mouthed opportunist has resurfaced again with his gapped fangs? FKK, you may call Agbati a ‘mere staff’ (what ever that means,)’ but me think your so-called ‘Ebora Owu’ remains one of the least qualified persons anywhere on planet earth to have lead a country. Well, we know the circumstances. But did he ever improve on the job? The 3 answers are: NO! NO!! and NO!!! Nuff said!!!!Mtcheeeewwwwwwwwwwwwwwwwww!!!!! Abati I used to think was one of the best critical analyists this country is gifted with, when he was a regular contributor on channels tv political programme until he was appointed a special assistant to Jonathan and suddenly threw his dignity and honour to the dogs and started exhibiting intellectual dishonesty to satisfy his master for peanut. He’s foggoten there’s life ahead for him and his children especially who’ll have to carry ahead the name ABATI and there was no need for him to mortbage the future of his children just to satisfy today. Is a shame the kettle is calling the kettle black. 8 years of OBJ leadership what did he achieved, improving infrastructures or what. If my memory can serve me very well, only what we can remember is mobile phone for all. The boko haram in question started when OBJ was in office what did he do? For Mr Kayode is mad and very tribalistic. What he fell to do someone is doing or is it a case of absence of Yorubas in the affairs aviation? Nigerians are watching! Obasanjo i will never support U, because U did not do better wen U are dia, may U have ask Him to kill de northerns de way U did to Niger delta, and he refuse Dat is why U are trying to run his government forgetting diplomacy is de best way to settle dispute Dan using dat Ur wicked military way of life. Old man go and sit down and wait for Ur death. For Me GEJ is trying just dat dia is much on de desk to deal with. God bless Republic of Nigeria. God bless GEJ. The glory of our great nation-Nigeria has been rubbished into the mud by criminals politicians from every session of Nigeria. After the sudden death of General Sanni Abacha, I never imagined that Nigeria will be unfortunate AGAIN to have selfish,unloyal and criminal leaders in various positions of authority. I’m no fan of former President Obasanjo in anyway, but OBJ kept us together as one indivisible nation. Anyone can easily argued that OBJ paved way for President Badluck Ebele Jonathan to power. Badluck Jonathan was unprepared to be president of the most populous and popular black nation in the world. However, I think giving an IJAW man the opportunity to lead us was a great idea by OBJ. OBJ is a nationalist that will rather do what is right for Nigerian interest rather than tribal sentiment. I don’t like him but I WILL always respect OBJ for that spirit of unity. President Badluck Jonathan will end up come 2015 has the worst president Nigeria ever had. Even if the president gives every Nigerian one million naira, he will loose the 2015 election in a landslide defeat because Nigerians are tired of his failures. This man is finished politically and time for a change come 2015. A weak leader with no vision like Jonathan has nothing good to offer to ordinary Nigerians. My advice to this president is for him to address those important issues raised by OBJ. well this is serious everybody is against him even boko ,governors and now baba that lead is people in the primarily to vote for good luck wow am speechless this is not happening cuz i watch the primarily my self God have mercy on us all cuz nobody is perfect well i want to say baba maybe right Nat should step down peacefully cuz we voted for him in peace people are killed not just one but millions well if u have lost somebody in such situation u know were the pain is coming 4r. i disagree because God is not an author of confusion . 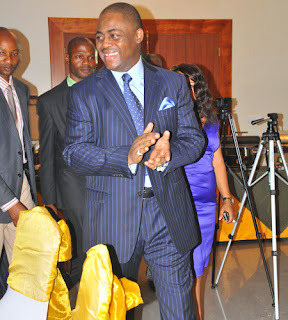 Fani kayode is sick,GEJ will continue to move this country to greater height. Allah gives and takes. No man can attribute the power of Allah to himself. If it was God that gives Jonathan power, no man on earth would stop him. Fani kayode, OBJ, Tinubu, Lie Muhammed, Buhari, El-Rufai and others can only try, but if God says no…that is final. Let shun tribalism and be very logical with our criticism. Uneasy is the head that wears the crown. In all these accusation, i do not see what Jonathan has done wrong. Just my personal opinion. The words of Femi Fani Kayode that OBJ’s letter has closed President Jonathan’s power did not portray him as a respectable stakeholder whose interest is directed toward strengthening the democratic and transformative process of this nation. It is an eyesaw that those who should be seen as law makers are themselves the law breakers. Let us use decent and paliating words that will cussion the heat that is already enkindled in the countray and not to ignite it further or rather propound it beyong measure. BABA’S letter is merely a calculative way to disablize the country. Only God can decide the fate of President Jonathan; no man has the power!!! I always trust God that he is going to use goodluck Jonathan in this country,forget about weather OBJ or BJO like it or not,he is not owner of Nigeria,and let him continue his criticism he will get tired or,he will die of criticism,BABA Goodluck’even if you don’t or you have not done anything for area I wish you all the best,God is behind you,and before you,beside you left and right,the strength to rule knowledge wisdom and understanding may God release all this upon you in JESUS mighty AMEN,may your name works for you! At the same time let who ever continue with his or her criticism carry on with it GOD is GOD is he not man I believe my country will be the best someday sometimes somewhere by God’s Grace Amen! @VISSION’you are a fool,how dose president GEJ cost you to loose your Muslim friends?are you not ashame or afraid of saying that in God’s present,is mulim is religion?are there not the onece causing crisis and deficit everywhere in the country?are there not killers?please,becareful and what you are saying!